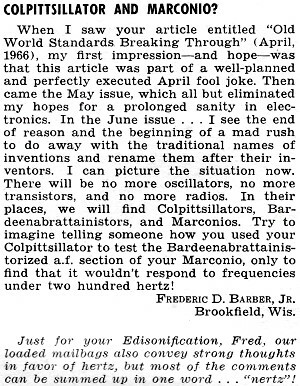 Popular Electronics reader Frederic D. Barber, Jr., was having none of the newfangled designations for standard physical units as reported in the April 1966 issue. He, and evidently many others, was not ready to accept the replacement of terms such as cycles per second (cps) with Hertz (Hz), or seemingly any other change that included honoring a person by using his/her name. We don't know whether he shunned units of Farads for capacitance, Ohms for resistance, or Henries for inductance. When I saw your article entitled "Old World Standards Breaking Through" (April, 1966), my first impression - and hope - was that this article was part of a well-planned and perfectly executed April fool joke. 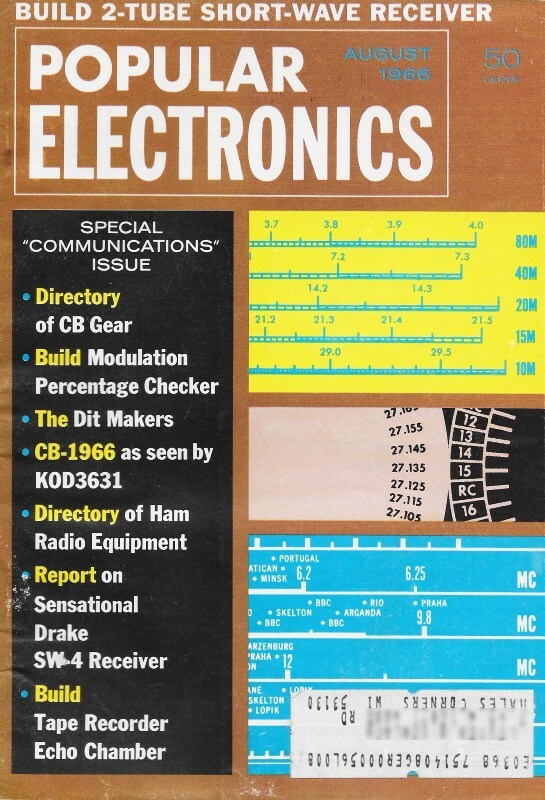 Then came the May issue, which all but eliminated my hopes for a prolonged sanity in electronics. In the June issue ... I see the end of reason and the beginning of a mad rush to do away with the traditional names of inventions and rename them after their inventors. I can picture the situation now. There will be no more oscillators, no more transistors, and no more radios. In their places, we will find Colpittsillators, Bardeenabrattainistors, and Marconios. Try to imagine telling someone how you used your Colpittsillator to test the Bardeenabrattainistorized a.f. section of your Marconio, only to find that it wouldn't respond to frequencies under two hundred hertz! Just for your Edisonification, Fred, our loaded mailbags also convey strong thoughts in favor of Hertz, but most of the comments can be summed up in one word ... "Nertz"!